Alcove Cabin creates a secluded space, which is enclosed on all sides and accessible through a single opening. 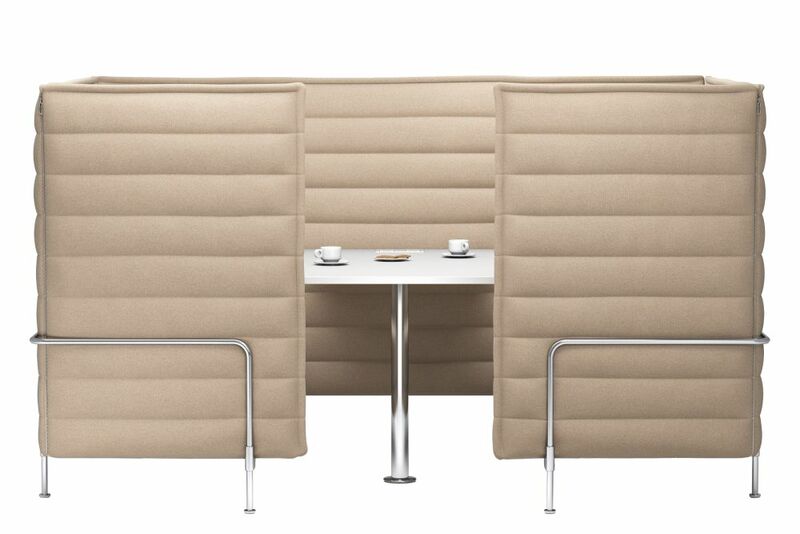 It provides visual and acoustic privacy for four to six people – especially the version with extra-high side walls. On the inside, Alcove Cabin has facing upholstered seats and can be optionally equipped with a table, power connections and lighting to serve as a full-fledged workspace. Tubular steel, chrome-plated or powder-coated (smooth), metal frame with MDF panel. Back and side panels with integrated MDF boards, connecting panel with integrated MDF board and metal structure, panel sections connected with zip fasteners. Polyurethane foam and polyester fibre. Work upholstery for work-oriented sitting, 480 mm (measured according to EN 1335-1 = 385 mm).